We have quarterly award ceremonies to celebrate our students successes and achievements. Students earn Attendance Awards for having 2 absences or less during the quarter. We really encourage being in school every day! Student’s who earn perfect attendance get extra recognition! Students are able to earn Honor Roll and Achievement awards each quarter. The awards go to students who earn all 3’s and 4’s on their report cards. We enjoy celebrating and rewarding students for their hard work! We like to encourage and celebrate school spirit! Every other Friday throughout the year is designated as a “Goodrich Gear Day”. On these days we encourage students and staff to wear a Goodrich t-shirt or sweatshirt, that can be purchased a few times a year through the school, or our school colors, blue and white! Family involvement is very important to us at Goodrich. Our staff, along with our PTO, host a variety of Family Nights throughout the year. 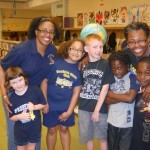 We have had movie nights, game nights, math & literacy nights, and other holiday events. Please see our school calendar for additional information and/or dates of upcoming events.